My heading above is an old English proverb expressing skepticism about all sorts of theories, prophecies and maybes. It dates from the time when the Middle English word "an" (meaning "if") was still understood in the Middle English sense. Tinkers were itinerant handymen who fixed up damaged pots and pans -- as pots and pans were valuable household goods in those days. Few people reading this will have seen a saucepan with a hole in it -- but I have. A couple of my mother's saucepans developed holes in them at one time when I was just a lad. 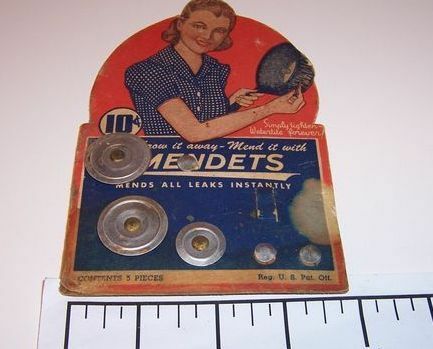 Being a handy kid, however I went to Woolworths and bought a set of "Mendets" -- which I used to fix the saucepans concerned. So tinkering in its original sense existed within living memory. I tell that little story because the article below immediately brought that old proverb to my mind. Putting it in modern English, I might have said: "More useless speculation". All it tells us is what would happen IF one of the hot periods of the earth's past were to be repeated. They assign no probability to that occurring, however. I wonder why? They do however pop in a little bit of deceit. They talk of global warming "continuing". But it is not ongoing so it cannot continue. If the West Antarctic ice sheet was to melt in response to increasing global temperatures, sea levels could swamp coastal towns and cities around the world. That's the warning from Scottish researchers who have plotted how the ice sheet is expected to respond to global warming. In particular, they claim that loss of ice in West Antarctica caused by a warming ocean could raise sea levels by a staggering 10ft (3 metres). In the first study of its kind, researchers were able to gauge how levels of ice covering the land have changed over hundreds of thousands of years. They did this by studying peaks protruding through ice in the Ellsworth Mountains, on the Atlantic flank of Antarctica. The team assessed changes on slopes at various heights on the mountainside, which indicate levels previously reached by the ice sheet. They also mapped the distribution of boulders on the mountainside, which were deposited by melting glaciers. Chemical technology - known as exposure dating - showed how long rocks had been exposed to the atmosphere, and their age. Their results indicate that during previous warm periods, a substantial amount of ice would have been lost from the West Antarctic ice sheet by ocean melting, but it would not have melted entirely. This suggests ice would have been lost from areas below sea level, but not on upland areas. The study shows that parts of the West Antarctic ice sheet have existed continuously for at least 1.4 million years. However, if global temperatures continue to rise, causing the oceans to become warmer, the a substantial amount of ice could be lost from the sheet. This could see sea levels rise by as much as 10ft (3 metres). Dr Andrew Hein, of the University of Edinburgh's School of GeoSciences, joint leader of the study, said: 'Our findings narrow the margin of uncertainty around the likely impact of the West Antarctic Ice Sheet on sea level rise. The study, published in Nature Communications, was carried out by researchers at the University of Edinburgh with Northumbria University and the Scottish Universities Environmental Research Centre. 2015 is now in the record books and, after billions of U.S. taxpayer dollars in EV subsidies for consumers and industry, Reuters reports: “only about 400,000 electric cars have been sold. Last year, sales fell 6 percent over the previous year to about 115,000, despite the industry offering about 30 plug-in models, often at deep discounts.” Though 400,000 EVs may have been sold, the actual number on the road is likely far less. Most of the “sales” are actually leases and when the lease term is over, the EVs get turned back into the dealer, and then the manufacturer. Drivers, even with generous incentives to buy the model they are driving, don’t want them. According to the Wall Street Journal, there is little demand for used electric cars. All of this, to reduce carbon dioxide emissions and appear environmentally innovative and technologically forward is missing the mark. In December 2014, a study was released that claimed that electric cars actually produced “3.6 times more soot and smog deaths than those powered by gas.” Study co-author Julian Marshall, and engineering professor at the University of Minnesota, says: “It is kind of hard to beat gasoline. …A lot of technologies that we think of as being clean are not better than gasoline.” In reality, these zero-emissions vehicles are generally fueled by coal. While EV advocates want to claim, as one did, that EVs are powered by wind and solar energy, the facts don’t support the fantasy. The Dutch city of Rotterdam is banning “the oldest exhaust spewing vehicles” from the city center. “Thanks to generous tax incentives, the share of electric vehicles has grown faster in the Netherlands than in nearly any other country in the world.” How are they meeting the “surging demand for power?” With three new coal-fueled power plants. The WP concludes: “But for all its efforts locally and nationally, the Netherlands will blow past its 2020 emissions targets, the result of the new coal-fired power plants.” More new coal-fired plants—powered by cheap American coal—are projected due to the increased demand from EVs. It turns out, Obama’s 1 million EVs by 2015 was a “pipe dream” after all. Even the federal government didn’t buy the projected quantities. His ideals are not consistent with either consumer interest or technology. President Barack Obama bound the United States to an international agreement on climate change, but the administration’s decision to circumvent Congress to implement the deal has lawyers questioning its constitutionality. Despite legally binding elements in the Paris Protocol, which require Senate ratification, negotiators worded the deal in a manner that enables Obama to handle it as an executive agreement and avoid congressional input. “The president’s decision to treat the Paris agreement as an executive agreement instead of a treaty is just his latest use of executive power to achieve an end that he knows full well would not pass congressional muster,” Steven Groves, a lawyer who is an expert on treaties at The Heritage Foundation, testified Tuesday before a congressional committee. Appearing at a hearing held by the House Committee on Science, Space, and Technology, Groves argued that the Obama administration knew that the Republican-led Congress would reject the climate plan. Instead of risking failure, he testified, Obama chose to sidestep the constitutional requirement that a president secure approval from two-thirds of the Senate before he may subject the U.S. to a legally binding treaty. Negotiators representing 195 United Nations member states met in Paris at the end of last year to finalize an international agreement aimed at cutting carbon emissions in hopes of slowing the potentially detrimental effects of climate change. Those effects, and their causes, continue to be hotly debated among scientists. Under the deal, the U.S. and participating countries will be legally required to meet every five years beginning in 2020 to present new plans intended to make deeper cuts in carbon emissions. Beginning in 2023, countries will be legally compelled to meet every five years to report on emissions levels and reductions. Although it isn’t legally binding, Obama also has pledged to pour $3 billion into the Green Climate Fund, a pot of international aid funded by developed countries to assist developing, poverty-stricken countries in reducing carbon emissions. Groves testified that the White House’s decision to avert congressional input “flies in the face” of the climate change treaty brokered during the 1992 United Nations Framework Convention. The goal of that treaty was to stabilize greenhouse gas emissions within a set time frame. Groves argued that President George H.W. Bush agreed with the Senate, then led by Democrats, that the chamber would ratify the 1992 treaty with the requirement that any future agreement containing targets and timetables be submitted to the Senate. Proponents of the Paris Protocol, including Andrew Steer, president and CEO of the World Resources Institute, contend that the deal is a “hybrid” agreement. They say it includes both legally binding conditions and voluntary pledges, and so does not require Senate ratification. “Having looked at this very carefully with our legal scholars, our scientists, and our economists, our view is that the agreement strikes the right balance between legally binding and nonbinding, given where we are as a global civilization,” Steer testified to the committee. The Obama administration intends to implement the agreement domestically through regulations written by the Environmental Protection Agency, including those created under the agency’s controversial Clean Power Plan. Groves, the Lomas senior research fellow in Heritage’s Margaret Thatcher Center for Freedom, predicted that the EPA regulations will be litigated among cities and corporations. Meanwhile, congressional Republicans have adopted resolutions disapproving of the administration’s plans. “If you want a durable climate change agreement, you have to involve Congress. This administration has chosen not to do that,” Stephen Eule, vice president for climate and technology at the U.S. Chamber of Commerce, testified during the hearing. “So, the question is, is this a durable and legal agreement? I would say no. Is the Christmas tree to blame for global warming? An expansion of Europe's forests towards dark green conifers has stoked global warming, according to a study on Thursday at odds with a widespread view that planting more trees helps human efforts to slow rising temperatures. Forest changes have nudged Europe's summer temperatures up by 0.12 degree Celsius (0.2 Fahrenheit) since 1750, largely because many nations have planted conifers such as pines and spruce whose dark colour traps the sun's heat, the scientists said. 'Two and a half centuries of forest management in Europe have not cooled the climate,' the team led by France's Laboratoire des Sciences du Climat et de l'Environnement wrote in the journal Science. 'It's not all about carbon,' lead author Kim Naudts told Reuters, saying government policies to favour forests should be re-thought to take account of factors such as their colour and changes to moisture and soils. A Paris agreement among 195 nations in December, meant as a turning point from fossil fuels, promotes forests to help limit a rise in temperatrues, blamed for causing more floods, heatwveas and rising sea levels. Average world temperatures have risen by 0.9C (1.6F) since the Industrial Revolution. Thursday's study was restricted to Europe but said similar effects were likely in other parts of the world with big forest planting programmes such as China, the United States and Russia. Two degrees Celsius. That’s the maximum amount of future global warming environmentalists say the world can tolerate. Anything more, they claim, and our efforts to stave off a climate catastrophe will fall flat. It’s a spurious magic number, but one that was formally adapted into the Paris climate agreement in December. And it won’t come cheap. The findings from Bloomberg New Energy Finance and Ceres, a Boston-based coalition of investors and environmentalists, show that wind parks, solar farms and other alternatives to fossil fuels are already on course to get $6.9 trillion over the next 25 years through private investment spurred on by government support mechanisms. Another $5.2 trillion is needed to reach the United Nations goal of holding warming to 2 degrees Celsius (3.6 degrees Fahrenheit) set out in the climate agreement." And no doubt that gap will be filled via wealth redistribution. Even worse, these numbers aren’t as bad as depicted in other studies, such as the International Energy Agency’s $16.5 trillion cost estimate. And that’s just through 2030. Instead of redistributing trillions of dollars, the better option would be for poorer countries to invest in energy sources we already know save lives — and let the free market figure out the future of energy. On "environmental" grounds, the previous Labor party government banned fishing in so much of Australian coastal waters that there are now few areas open to fishermen. So despite its enormous expanse of coastal waters, Australia has to import a lot of the fish it needs. There has to be compromise but when did you ever hear a Greenie compromise? Australia’s leading marine scientists are appealing to the federal government to reject a review expected to recommend a significant reduction in the size of ocean sanctuaries and an expansion of areas permitted for commercial fishing. Tony Abbott announced the review of the boundaries of Labor’s marine parks, counted by the former government as one of its greatest environmental achievements, during the 2013 election campaign, and said he would scrap the just-finished management plans so that the fishing industry could be given a greater say. The leading scientists understand the review, now finally completed, recommends a sizeable reduction in some areas previously designated as closed to fishing and trawling, particularly in the Coral Sea, and say it has ignored expert scientific advice. “If the government winds back what was already just partial environmental protection it would be terrible for the environment and send a terrible message to the world,” said West Australian marine science professor Jessica Meeuwig. “We have no faith in this process. They haven’t spoken to marine scientists, despite our best efforts. They spent a lot of time talking to the extractive industries. If Malcolm Turnbull is serious about being guided by science and by evidence he will reject recommendations to reduce marine sanctuary zones,” she said. “We have seen little evidence that the review process has focused on scientific evidence, rather it appears to have largely been an exercise in appeasing stakeholders with extractive interests,” the OSCA members state in the analysis report. Osca’s members also include Hugh Possingham, the director of the Australian Research Council Centre for environmental decisions at the University of Queensland and Ove Hoegh-Guldberg, director of the Global Change Institute and professor of marine science at the University of Queensland. “We know that the biggest supporter of environmentally responsible fishing practices is the fishing industry – because they do not want to harm the very environment that is providing them with a living,” the Coalition said in its policy statement. Labor always rejected concerns by the fishing industry that it was “locking up oceans”, saying less than 2% of commercial fisheries’ catches would be affected by the new protected areas and recreational fishers would not be affected at all because the parks were hundreds of kilometres offshore and therefore well out of reach of a fisherman in a tinnie. After a long period of consultation, Labor announced its decision to protect more than 2.3m sq km of ocean in marine parks in late 2012, offering $100m in compensation to the fishing industry. Environmental groups declared a historic victory, but fishers and charter operators began a furious campaign against the move, strongly backed by some Liberal and National party MPs. The then environment minister Tony Burke said the marine parks would protect “some incredible marine environments, including the Perth Canyon in the south-west and the stunning reefs of the Coral Sea, and this announcement cements Australia’s position as a world leader on environmental protection’’. Restrictions on fishing in the reserves varies from a total ban to a trawling ban, to areas where recreational catch and release are permitted. Announcing the panels conducting the review in 2014 environment minister Greg Hunt said it would be based on science and aimed to “restore community confidence” in the marine reserve system. “Unlike the previous government, we are committed to getting the management plans and the balance of zoning right, so we have asked the expert panels to consider what management arrangements will best protect our marine environment and accommodate the many activities that Australians love to enjoy in our oceans,” he said.